In recent weeks Bruce Gilden, a New York City photographer and Magnum Photos full member since 2002, has been receiving some well deserved attention via the internet. A short film was recently produced by Benjamen Walker and Andrea Silenzi for WYNC’s Streetshots, emerging flickr groups have been inspired by him, and message boards have been buzzing with praise and disdain for his work and style. As for myself, I had never heard of Bruce Gilden until a friend of mine sent me a link to Benjamen and Andrea’s short. And within seconds of clicking play and hearing the first syllable resonate from the back of Gilden’s throat — I was hooked. I didn’t even have to see a single photo. But once I finally did see a Gilden image, I knew I had to try imitate it. Thus, became the The Bruce Gilden Experiment; the first in a series of postings where I set out to produce work inspired by and similar to the photographers that I admire. While conducting The Bruce Gilden Experiment, and along with fighting my innate tendencies to shoot in my usual way (which, nonetheless, is starting to bore me), I found it difficult, except for the above photo, to capture an image within a foot of a person’s face that I could truly appreciate, or want to call my own. Maybe it was the 24mm L series lens I chose to use. Maybe it was the choice of using color film, something I very rarely do, or Gilden does. Or maybe it was my narcisistic belief that I could produce work on par with Gilden while trying to imitate a style that is completely uncharacteristic of my own. I don’t even own a flash, nor do I know how to use one. And I’ll probably never learn how to operate one because that is something I am simply not interested in learning…for now at least. After about an hour of shooting around the Hollywod and Highland area and processing the rolls at Rite Aid (which develops film as good, or even better, than most of the professional labs in LA) and then scanning them at home, the majority of the images were either out of focus, or more importantly, lacked the astounding beauty associated with a Gilden image. Overall, I could say it was extremely disappointing to see such average work. Something I think we can all relate to — I hope. Before deciding to conduct this experiment I set out with the intention of failing, which, I think I did. I’ll probably give it another shot and try a few things differently. But maybe…just maybe…one day Bruce Gilden, or somebody else will conduct The Discarted Experiment. I don’t know — is the quality of the work that good? Good enough to inspire somebody? 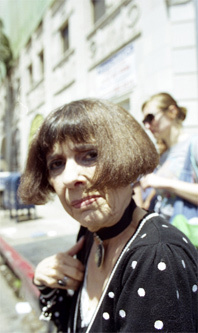 To see more photos captured during The Bruce Gilden Experiment click here. To see my usual style go here. To see the amazing work of Bruce Gilden go here. To see a wonderful short of Bruce Gilden in action go here. don’t need it…have plenty…actually I’m full of total arrogance some times regarding my ability to produce quality work (like now for instance). see, there’s some confidence for ya.